Space Hopper Football Inflatable for Hire. Book your Space Hopper football today. A hugely amusing game where quite frankly footballing talent is irrelevant! 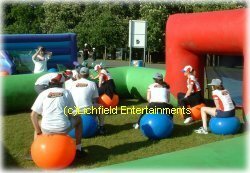 Great for family fun days, team building, etc. Huge fun for ages 6 to adult. For this activity you'll need a grassed area of at least Size 40x30ft. For safety reasons we only operate this activity on a grassed surface, tarmac and concrete surfaces are not suitable due to the inevitable falls from the hoppers. or kids Football themed Bouncy Castle? If you have any queries, questions, or would like to book your own human table football please call us on the number below or click to enquire and we will do all we can to help.